Bad weather is a common worry for those seafarers learning to sail but it needn’t be if you make adequate preparations and precautions. The most effective method of avoiding the effects of bad weather at sea is just to avoid sailing altogether. A primary reason for sailors getting caught in heavy weather is because they ignore warnings in their determined efforts to get to the next port or to return home. Modern technology means there is no reason for you to put yourself in danger. Not only can you refer to local weather forecasts before setting out but you can now receive updated forecasts once under way. It is not advisable to sail for a few days in the aftermath of a storm as it is often still traumatised and consequently rough and uncomfortable. Of course there are times when getting caught in bad weather is unavoidable, such is its capricious nature. It is therefore important that all sailors know how to keep their crew and boat safe in dicey weather conditions. So what can you do if you do happen to get caught out by bad weather? 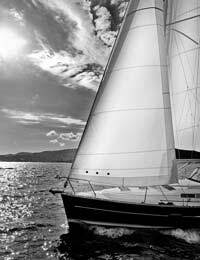 The first action should be to draw up a plan that weighs up your present position and the safest course to sail. If the original plan is no longer a wise one then your course should bear away onto a reach or run point. Remember to always sail to the crew’s abilities and not those of the skipper or craft. Reefing is term applied to when the sail area is reduced by partially lowering the sail and tying or rolling it to the boom. It is also one of the key tactics in preparing a vessel for a storm and should be practised to perfection well in advance. It is inadvisable to reef at the last minute and all in one go, but instead early and progressively. In particularly rough seas it can be advantage to have the assistance of a motor to give extra power against the action of the waves. Using the motor to work with the sails can also help reduce the fatigue of the crew and therefore keep them alert and less likely to make mistakes. Dressed for the weather whilst on deck. Given sea-sickness medication – even the most hardy seadogs can go green when the waves rise up. The most basic way of preparing for the worst is to create a ‘float plan’. This is a simple written instruction that informs designated people ashore – friend, relative or marina operator - where your boat is heading and when you expect to return. If you fail to return back to base on time then the responsible parties on land will be able to raise the alarm and be able to use your float plan to locate your vessel. Name and home phone number of the boat skipper – this is so that it can first be established whether the skipper has already returned home having forgotten to check back in before sending out the search party. Description of the vessel including registration number, colour and size. The trip plan – this will say where you are going including latitude and longitude positions, approximate return time and any journey destinations. Emergency numbers – these are the numbers that the holder of the float plan should phone in case of an emergency. If you are the proud of owner of a well-built, well-kept vessel then bad weather is not something to worry too much about – it is an experience to endure rather than something life-threatening. If you are unfortunate enough to be caught out then look on it as a valuable lesson; there is nothing that will prepare you more for a storm than having already endured one. In fact a good way to prepare mentally and physically for a storm is to take your vessel out for the afternoon in strong winds and choppy seas. This is great experience in practising your reefing skills and your ability to manage discomfort at sea.